I love tuna...and pasta. Together or separately. I eat them because I like them. 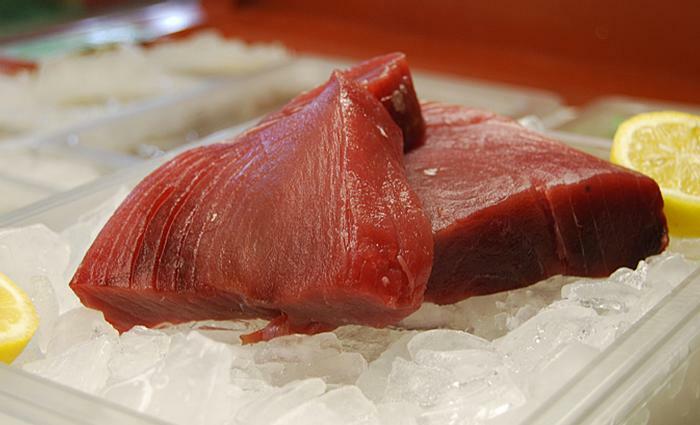 In Italy, yellow fin tuna is favored over the paler variety. It has a stronger flavor. 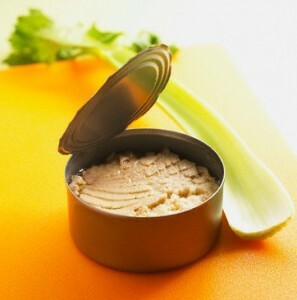 I love to open a can packed in olive oil to make a summer salad. The tuna, drained, crumbled in a bowl with halved or quartered cherry tomatoes, black olives, and a bit of basil. And there’s tuna with cannellini beans, another summer salad with chopped red onion, drained beans, and tuna. Both are staples on my table all summer long. In winter, I cook with it. Pasta. What can I say? Here on the boot it is noble fare, eaten stuffed or sauced, baked or boiled. It can be as simple as tangled strands of spaghetti with oil and breadcrumbs or as elaborate as linguini with shrimp and artichokes bathed in cream. The sizes and shapes are infinite. You could eat pasta every day for a year without repeating a recipe. But put them together—pasta and tuna—and you reach perfection. Here are two recipes fit for a dinner party, one with canned tuna and one with fresh. Both are elegant, the first for those with a thin purse, the other for those with a fat one. 1. Put the oil in a frying pan and add the onion, garlic, half the parsley, and cayenne pepper. Sautè until the onions are soft. 2. Add the tuna and stir a moment to mix. 3. Add the tomato sauce and check for salt. Add more if needed. 4. Let the sauce cook over a low flame until it has reduced to a thick paste. 5. In the meantime, cook the pasta in boiling salted water until chewy and not too soft. 6. Add the cream to the tomato-tuna sauce and stir to incorporate it. Taste and season with salt and pepper as desired. 7. Drain the pasta, and add it to the sauce. Stir. 8. Serve with a sprinkle of chopped parsley. Note: you may be able to find fresh pesto in a specialty shop; otherwise put this recipe on hold until spring. 2. Wash and stem the cherry tomatoes, and cut them into quarters. 4. Put the oil in a frying pan and add the onion; cook until soft and translucent. 5. Add the tuna and let it brown on all sides. 6. Bathe the tuna with the wine and allow it to cook over medium heat until evaporated. 7. Add the cherry tomatoes, salt and pepper, and cook, stirring from time to time with a wooden spoon, for about ten minutes. 8. Meanwhile cook the pasta, taking care not to let it get too soft. 9. Drain, reserving a little of the starch-laden cooking water. 10. Add the pasta to the sauce and stir. 11. Blend in the pesto and enough of the cooking water to make the dish creamy. 12. Let the dish set for a couple of minutes for the flavors to mingle and serve. Patricia, I love that combination too, so thanks for two great-sounding recipes to add to my appalling collection. I'm looking forward to trying them. Good, Judy. Hope you enjoy. I love tuna and cannellini beans! There's a tuna/pasta recipe I used to make that included roasted red peppers, tuna and toasted bread crumbs. Yummy! My character in Allergic to Death serves her clients a lunch of tuna and cannellini beans! I'll try that roasted red pepper-tuna combination. Sounds delish! I love both tuna and pasta. I'll have to try these. I'm happy with linguine with vegetables--zucchini, any color pepper, roma tomatoes, onions, and black olives. We buy a huge bag of dried shitake mushrooms at the oriental grocery store and always add some to our meals. They have a rather strong taste, but they blend beautifully with most dishes. Now I'm hungry. I hope you enjoy them, Polly. I went mushroom hunting at the end of last week, and we enjoyed grilled and oven-baked mushrooms. I'm using the remainder today in a sauce with cream and shallots--for either pasta or over grilled chicken breasts.